If Blessing Means that Good Things Happen to us, What Then Does it Mean When Bad Things Happen? It has to be a blessing when good things happen to us, right? [Job said] “The Lord gave and the Lord has taken away; may the name of the Lord be praised.” In all this, Job did not sin by charging God with wrongdoing.” (Job 1:21-22, NIV). “After Job had prayed for his friends, the Lord restored his fortunes and gave him twice as much as he had before.” (Job 42:10, NIV). The story of Job is full of things that are difficult to understand, much like life sometimes… Job was an upright, blameless man who loved God and shunned evil. Satan asked for and received permission to test Job’s love for God, claiming that Job only loved God because he was protected from misfortune. Satan then destroyed all that Job had, claiming not just his worldly goods but also the lives of his children as well. Job’s 3 “friends” came around to counsel him, and they relied upon the conventional wisdom that said misfortune only happened to those who sinned. And really, don’t most of us think that we are somehow to blame for random bad things that happen to us? That there is some sort of vigilante justice loose in the universe, “karma” that brings evil upon those who commit evil? When something bad happens, don’t we cry out, “What have I done to deserve this? 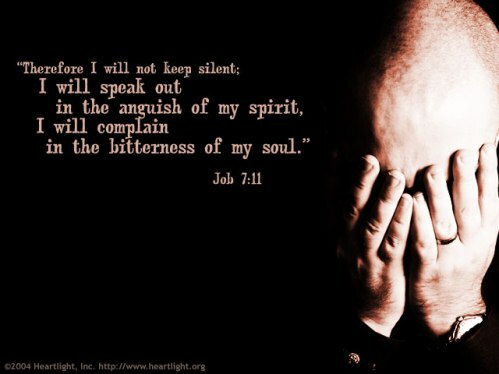 !” Job stubbornly refused to confess his sin (he actually was upright and blameless in this mess), and refused to blame God. Even his wife told him to “curse God, and die!” Yet he held on to his faith. The story of Job is written primarily to countermand the idea that bad things happen only to those who do bad things, and the assumption that anyone who has suffered misfortune or impairment must have done something to deserve it. Now, yes, there is cause and effect, and yes, sometimes actions have consequences, but Job teaches that not every tragedy happens because we deserve it. Evil can happen because we live in a fallen world where there is no guarantee of safety. Satan roams this world as a spiritual terrorist, randomly causing bad things to happen in the hope that he will disturb any notion of truth, faith or love that may exist. If the Great Deceiver can use tragedy (or even cause and effect) to get someone to blame God or deny Him, then the devil wins. Destruction is Satan’s handiwork, and cynicism is Satan’s playground. Those things, along with self-righteousness and being judgmental, are the tools he uses to disrupt lives and destroy testimonies. But Job refused to be cynical, and he continued to honor the Lord. He did have to realize that he was not prosperous because of his own righteousness, and that we can’t manipulate blessing by being righteous. Even in his own earthly righteousness, Job had room to grow in his understanding about the Lord, and room to be honest with his God. Job discovered that blessing was not in his self-righteousness, and not in his stuff. Blessing ONLY comes from a sovereign God, and our growth comes from acknowledging Who. He. Is. In 42:2 Job said, “I know that you can do all things; no purpose of yours can be thwarted. You asked, ‘Who is this that obscures my plans without knowledge?’ Surely I spoke of things I did not understand, things too wonderful for me to know.” There are perhaps in this universe things “too wonderful for us to know” at this point. We will certainly know them someday, but perhaps for now, simply knowing God IS the blessing. Once we figure that out, well then stuff is just stuff. Won’t stop you being stressed up. But what about when everything goes bad, and things are tough? Stop and realize this: our blessings don’t depend on stuff. But blessings don’t just come from God: the blessing, friend, is HIM. God blesses us so we can give His blessings all away. Our blessings are not stuff, but HIM. That’s all I have to say.